Mafia Wars is a very popular game on Facebook with thousands of players playing it at any given time of the day. It is a so called browser game in which the player takes on the role of a Mafia member with all sorts of options at hand; from fighting opponents to running jobs, buying equipment, recruiting new Mafia members, buying properties and more. The Mafia Wars player levels up once enough experience points has been earned. Experience points are won by either running jobs, e.g. muggings or bank heists, or fighting other Mafia Wars members. The two most important attributes in this regard are Energy and Stamina. Energy is being used to run jobs while Stamina used to fight other Mafia families. Each attempt at a job or fight reduces the available attribute, and the player has to wait for the Energy and Stamina to replenish before continuing to do jobs or fights. These points are replenished every five minutes (one point that is) to the current maximum defined by the player's stats. This means that the Mafia Wars player has to log in regularly to spend the points to avoid losing points as points are not longer gained once the maximum has been reached. That's where Mafia Wars Autoplay comes into play. 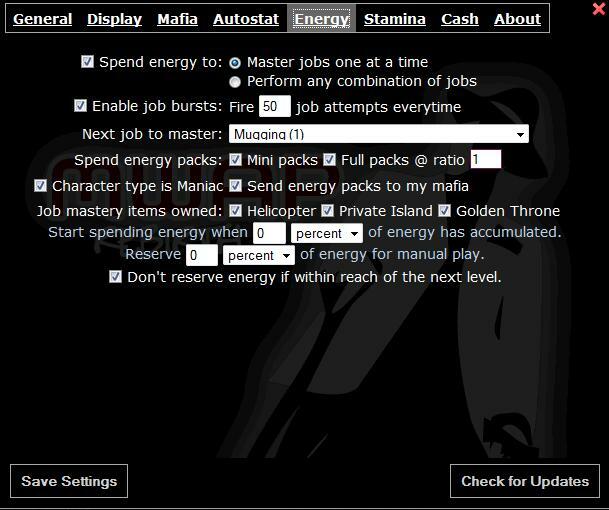 The script is highly configurable and can be used to perform actions in Mafia Wars automatically. This ranges from jobs and attacks, to leveling up and buying properties. The script offers many configuration options to play Mafia Wars on autoplay. The developer has created a video that explains most of the settings, and that's what makes it a recommended watch as it explains the settings and tells you how to configure the script for maximum effectiveness. Once configured correctly, the Mafia Wars Autoplay script will take care of the rest and the player's presence is no longer required. It can for instance run all night or day so that all points are spend and none wasted. The script is very sophisticated and a great help for every Mafia Wars player. Installation is straightforward. The script is provided for the web browsers Google Chrome and Firefox. Firefox users need to install the Greasemonkey add-on first and then the Mafia Wars Autoplay script. Google Chrome users can directly install the extension. Got additional Mafia Wars tips? Let us know in the comments. Update: We have removed the links pointing to the extension as it has not been updated in a while and is no longer compatible with the most recent version of Mafia Wars on Facebook. We would also like to caution anyone to install Mafia Wars scripts as many of them are designed with malicious intent. While you may find legit ones as well, it is necessary to audit the source code of each script to make sure that it is. Mafia Wars Autoplay is a script for browsers supporting userscripts to run automated actions while playing Mafia Wars on Facebook. You install it in the extensions / add-ons menu of your browser.